How Should Social Media Etiquette Be Taught in Schools? An adapted version of this post can also be found at Ed Tech Magazine’s website here. First of all, even though students may appear to be comfortable using technology, it should be not be assumed that they already know how to use it appropriately. In a 2012 article by Baiyun Chen and Thomas Bryer from the University of Central Florida, they found that many students are not using social media for learning purposes. At the same time, the majority of young people are connected with others online. With this in mind, teaching students how to appropriately use social media is a school’s responsibility, to help ensure they are safe online as well as leveraging its potential for learning. Second, social media can provide two things that are critical for student engagement in a literate environment: audience and purpose. Audience refers to those who will see what students create and share. With the possibilities social media provides, no longer are students writing for their teacher or peers alone. For example, they can post a project on a classroom blog or on Edmodo, a safe social media site for classrooms. Students, family members and teachers across the globe can now view their work and even comment on it. This type of feedback is valuable for student growth. It also teaches students the importance of revision and being appropriate when posting online. Purpose is the reason students are doing the work. Social media can help facilitate their own growth and as well as their audience’s learning when the purpose is to teach others. Before sharing occurs, essential questions should first be considered before students post their thoughts and work online. Is my project original and creative? What will my audience gain from what I am presenting? Will it make a positive impact on my community? The world? Can others add to what I shared and collaborate with me, potentially making it better? Once the why has been established and engagement is built with students, teaching the how should be much easier. What educators bring to the table are a strong understanding of pedagogy – the art, science, or profession of teaching (Merriam-Webster). 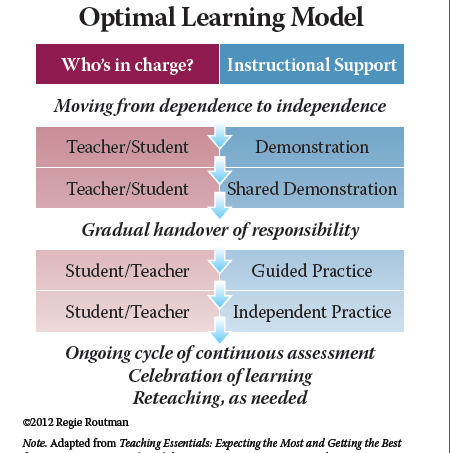 The instructional framework my school subscribes to is the Optimal Learning Model, sometimes referred to as the gradual release of responsibility. In this framework, the teacher first models the concept or skill to be learned. Will Richardson and Rob Mancabelli value this framework within the context of social media, stating in their book Personal Learning Networks (Solution Tree, 2011) that “the ability to model your own learning networks in front of your students might be your most important pedagogy of all” (12). To start, the teacher and students could share one thing they learned that day on a classroom Twitter account or Facebook page. They could also explore other classrooms’ blogs to read how students at their age level write online. Once a level of comfort navigating online has been established, the teacher can do an interactive writing activity on a classroom blog. Interactive writing is an example of shared demonstration, when the students and teacher share the responsibility for the work. This concept that “we do it” is critical when trying to build student confidence in order for them to eventually learn independently. When the teacher believes the students are ready to work on their own, he or she can set up blogs for each one of them. I recommend KidBlog as a great place to start. As the website describes, it is a safe and simple blog for students. They can now be encouraged to write for their own purposes, while consistently being reminded that their potential audience is anyone in the world. At this point, the sky is the limit. Students can curate digital portfolios that show their own learning growth over time. They could also collaborate with students in other communities on school projects and facilitate conversations with their audience in the comments. And I am only referring to blogs. Skype, wikis, and podcasts are just a few of the many other available social media tools students can utilize for learning. What is important is the teacher is there as a guide, helping his or her students create a safe and positive digital footprint while immersed in authentic, purposeful learning for the world to see.